Seals swimming off Pembrokeshire have been fitted with satellite 'phones' so researchers can find out what they get up to when they go on their travels. 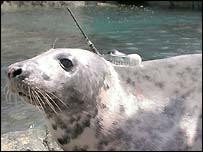 The transmitters have been placed on the necks of seven grey seals caught around Ramsey Island. Data sent back will be used to help experts understand the habits and feeding habitats of the mammals. A study of more than 1,200 of the county's seals in the 1950s and 60s found they travel great distances. They were spotted in Cornwall, Ireland and north Wales but why they travelled to such locations and how they got there remained a mystery. The transmitters - which look like mobile phones and are little bigger than a pack of cards - were fitted by an experienced seal team with help from the Countryside Council of Wales (CCW) and RSPB. They do not bother the seals and are designed to fall off naturally when they moult in late winter. A further 13 of the devices will be fitted to seals at Bardsey Island in north Wales and Hilbre Island in the Dee Estuary. They will be monitored by the UK's Sea Mammal Research Unit based in Scotland. CCW marine conservation officer Blaise Bullimore said: "Although grey seal distribution at sea is relatively well known around much of northern Britain, the opposite is true in Welsh waters. "We know from research that some seals travel very long distances - up to 2,100km - and others to very precise areas to feed. "Over 1,200 young Pembrokeshire seals were fitted with coloured tags in their hind flippers during the 1950s and 60s. "Some of these were later re-sighted as far apart as Cornwall, Ireland and north Wales, but where they went and what they did before being sighted weeks or months later remains a mystery. "Now we hope to solve this case and to find out what Welsh seals get up to on the way."